The resort hotel was to be built at the foot of the Chinese holy mountain Tianmushan. The region is characterised by thickly forested valleys dotted with farming villages. 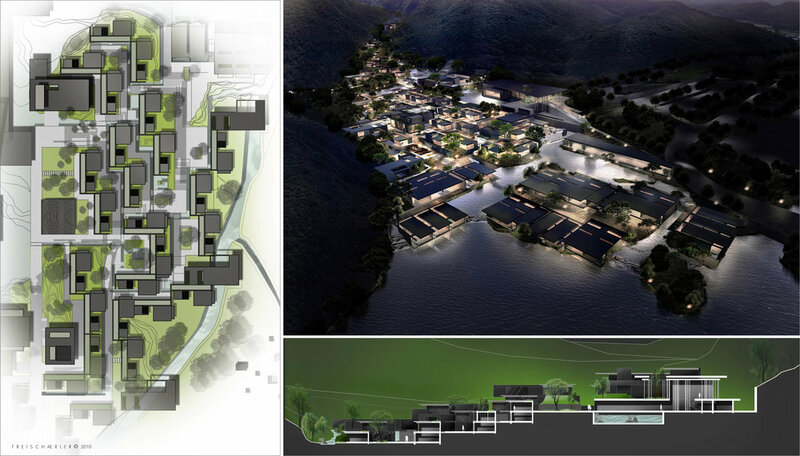 The resort's design orientates around that of traditional mountain villages, with the layout featuring a multitude of differing building types. Impressive contrasts between the secluded interior spaces and the open village layout with squares, laneways, restuarants and shops are created. The 100 luxury villas are offset to oneanother along the topographical lines, guaranteeing each uninterrupted views of the landscape. Strewn with gardens, ponds and channels, the property blends naturally into the surrounding densely wooded valley. Each villa is inspired by two classic Chinese archetypes - the introverted Beijing courtyard house and the entirely open garden house/the garden house, open to all sides. In this way panoramic views into the valley as well as completely secluded sleeping and wellness areas are created. To accommodate the Chinese practice of travelling in large groups, the villas are clustered together, in time establishing the atmosphere of a vibrant village while still providing complete privacy and relaxation.